We love our Pipsqueak Productions Dog Breed Mugs! They are our favorite coffee cup for our morning coffee or our afternoon lattes. We personally use the delightful miniature pinscher mugs, but we probably have your favorite breed, too. Sold in sets of 4. Why not buy a set of these beautiful dog breed mugs to brighten up your mornings or afternoons? The dog breed mugs are part of the Pipsqueak Productions line of pet greeting cards and gift company that pet lovers adore. Owner and creator, Mary Badenhop is known for her witty interpretations and original illustrations of your favorite dog breeds. 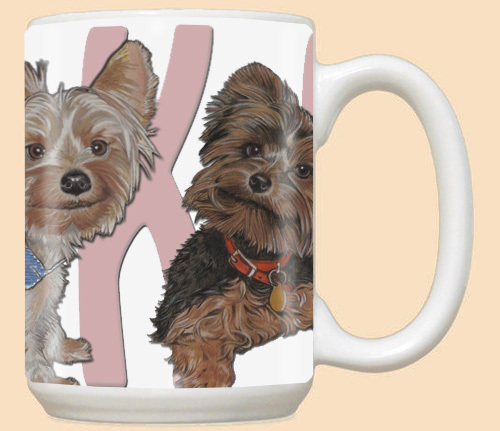 Pipsqueak Productions are the "Best in Breed" when it comes to these artistic, designer dog breed coffee mugs. The dog illustrations of your favorite breed will surely bring a smile to your face each time you pick up one of these cups. This will be your favorite cup to drink your morning coffee or afternoon tea. These witty dog illustrated designed coffee mugs are sturdy but also "light"in weight, and have the most comfortable handle. The mugs are oversized and hold 15 ounces. Microwave and dishwasher safe. Mugs won't fade in sunlight either as they are UV safe.